We don't expect the US Treasury's April FX report, due mid-month to formally label any major country a currency manipulator based on the current '3 criteria' approach stipulated in Section 701 of the 2015 Trade Facilitation Act. If anything, Thailand is at borderline risk of meeting all three criteria should the US Treasury opt to include it in its analysis for the first time. Thailand has not featured in prior reports, though given that it just about now has a bilateral trade surplus of greater than US$20bn (we use US Census trade data), the Treasury may deem Thailand to be a major trading partner - and therefore one that warrants inclusion in the report's analysis. If this were the case - and given that Thailand also meets the current account surplus and FX intervention criteria - the US Treasury may be required to label it a currency manipulator. Indeed, this mercantilist US administration may see fit to make an example out of Thailand - especially as a show of force on its clampdown on what it deems as unfair trade and FX policies of its major trading partners. But alternatively, we note that it could give Thailand a 'hall pass' on the FX intervention front - not least given that the Thai Bhat (THB) has appreciated by more than 13% against the US dollar since 2017. No country has ever been formally labelled a 'currency manipulator' by the US Treasury - so the choice taken here would give investors a clear signal into how serious the Trump administration is in its 'America First' protectionist policy pursuit. Certainly, labelling any country a 'currency manipulator' would keep US trade policy uncertainty at its current elevated levels. As a side note, it's worth keeping in mind that the 2015 Trade Act gives any officially labelled 'currency manipulator' a 12-month grace period to address its undervalued exchange rate or large current account surplus. China remains on the 'monitoring list' despite not meeting two out of the three criteria any longer. China does not warrant featuring on the 'monitoring list' based on the US Treasury's own guidelines as it won't have met two out of the three criteria for four consecutive reports now. However, the Treasury has stipulated that the significant bilateral US-China trade deficit in itself warrants keeping a watchful eye. As such, we would expect China to once again feature on the 'monitoring list' - and this is likely to keep US-China trade and geopolitical tensions on a knife-edge. China is labelled a 'currency manipulator' by Trump despite no circumstantial evidence. The tail risk - and one that we cannot fully rule out is if President Trump disregards Congress law and proceeds with labelling China or any other major country a 'currency manipulator'. If this happens, it won't be a huge surprise given that one only has to cast to cast their mind back to the early Trump administration this time last year - who labelled China as the 'grand champions' of currency manipulation. And Germany was accused of using unconventional monetary policies to keep the euro 'grossly undervalued' (see here). Therefore, in our view, a tougher stance on Chinese FX policy will be a huge escalation of global trade and political tensions - and one that would serve as a risk-off catalyst for global markets. Who's on the US Treasury's currency manipulation hit list? 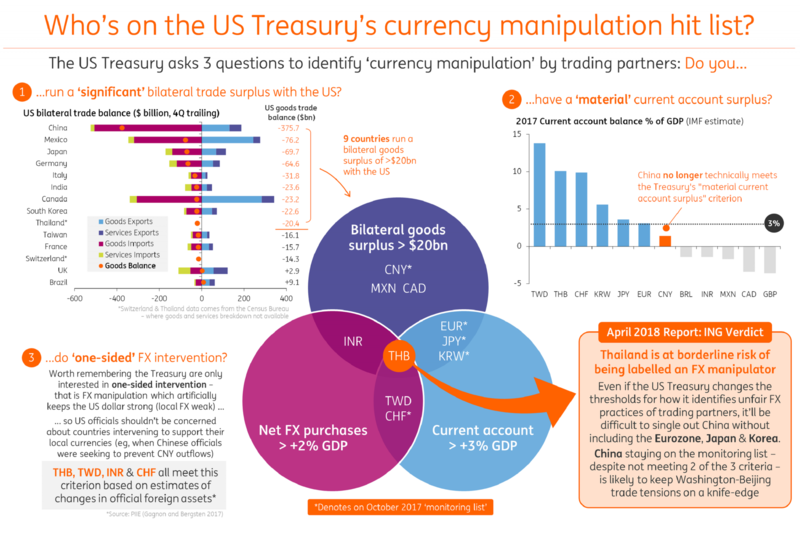 We note that Thailand is at borderline risk of being labelled an FX manipulator by the US Treasury should they to be included in the report this time around. Even if the US Treasury changes the thresholds for how it identifies unfair FX practices of trading partners, it’ll be difficult to single out China without including the Eurozone, Japan & South Korea. However, China staying on the US Treasury's 'monitoring list' – despite not meeting 2 of the 3 criteria – is likely to keep Washington-Beijing trade tensions on a knife-edge. As such, we do not fully rule out a cold trade war spilling into a potential cold currency war. While President Xi's speech on Monday evening took a more conciliatory tone in the US-China trade war saga, market headlines at the start of the week were dominated by unconfirmed reports that China is studying the use of CNY devaluation as a potential policy response to any trade war escalation. While it may appear as if Beijing is simply considering the full extent of policies they could deploy to respond to President Trump’s protectionist rampage, our Greater China Economist Iris Pang does not believe that this approach will be a realistic outcome. Not least given that Chinese officials have spent considerable effort in recent years to erase any CNY devaluation sentiment within markets. Nevertheless, the broader market implications of Chinese officials pursuing a policy of yuan devaluation in response to an actual US-China trade war would be almost the polar opposite to what one would see if Beijing adopted the widely-cited alternative artillery at its disposal which is the ‘dumping’ of US Treasury holdings or what we describe as a 'diversification out' of Treasuries into other non-USD assets. Below we highlight how these two different approaches would have contrasting implications for the US dollar, Chinese yuan and broader EM Asia FX bloc. Deterioration in global risk sentiment weighing on risky assets (including EM FX against the USD). Not only would it be seen as an escalation in any trade war and one that may ultimately spillover into a currency war but past CNY devaluation episodes have also been seen as 'exporting deflation' to the rest of the world. This bearish sentiment channel is likely to have a knee-jerk negative effect on risk-sensitive assets. Following the surprise 8/11 CNY devaluation, global equities fell by more than 10% between August-September 2015, while the broad EM FX index also tumbled by more than 6% during this initial period. Indeed, the risk of broader competitive devaluations would pick-up significantly in response to a more protectionist White House- which would be a lose-lose for the global economy. Therefore should China opt to take this trade war into the currency arena, we’d expect emerging markets Asia FX to move lower and in particular, Trump trade-sensitive currencies like the Korean won (KRW) and Taiwanese dollar (TWD). 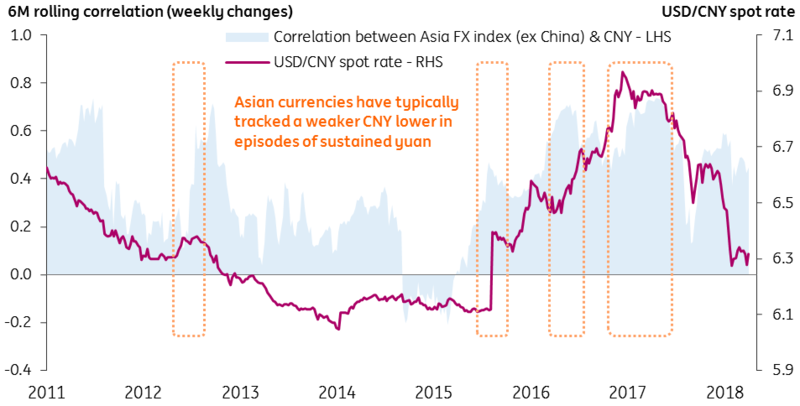 Our analysis shows that a basket of Asia FX (excluding CNY) has a correlation of 0.53 during weeks when CNY depreciates by more than 0.25% (see the first graphic below). As such, a sustained 5% depreciation in CNY would be consistent with a 2.5% move lower in the EM Asia FX ex-China index. 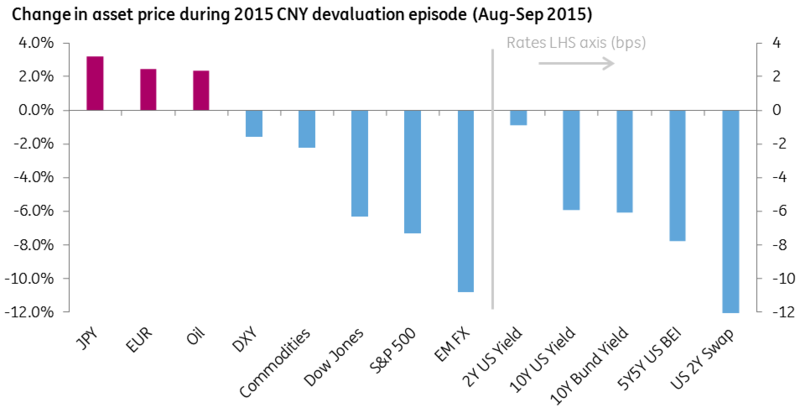 The second chart below shows how global assets reacted during the August 2015 CNY devaluation episode and we would expect a broadly similar reaction if Chinese officials adopted a similar policy approach. The safe-haven JPY would be an outperformer in FX markets, and we would expect USD/JPY to move lower towards the 100 level as it tracks any sharp decline in equity markets. Equally, we note that a broader flight-to-safety would mean US yields moving lower, in particular, the 2-year US rates could move around 25bps lower as the Federal Reserve would likely pause any tightening efforts in the midst of increased volatility. This channel would see the USD modestly weaken against the EUR - though any EUR/USD upside may be limited as investors also push back their nascent ECB tightening expectations. While the flight-to-safety in the CNY devaluation approach would see bond yields moving lower, if Chinese officials choose to diversify out of US Treasury holdings and into other non-USD assets, then one would expect to see the market dynamics of higher US yields and a weaker US dollar transpire. As we have explained in our Trump Trilemma note, such dynamics may already be in play. however, the idea of Chinese officials 'dumping' US Treasuries may be slightly overexaggerated. In the absence of China's large trade surplus with the US diminishing any time soon, there is a structural reason for Beijing to hold USD reserves in the form of safe, liquid USD assets. Indeed, the IMF's reserve adequacy metric estimates that China's overall reserve holdings should be around US$2 trillion. Under a 'Cold Trade War' scenario that doesn't take risky assets lower, one of the themes we may see emerge over the coming month is Asian central banks allowing the required tightening of monetary conditions to come through via the channel of a stronger FX – as opposed to higher policy rates. Indeed, while the broad Asia FX index (ADXY) has failed to push on above its multi-year highs partly due to Trump tariffs on China having the counterproductive effect of weighing on Asia FX, we believe that Trump-sensitive currencies within the region (i.e., CNY, KRW, TWD & THB) will largely trade on a firmer footing against the USD – not least as a means to defuse trade and FX manipulation concerns of the White House. While Congress has defined the broad definitions (words above in bold) for these three criteria as stipulated in Section 701 of the 2015 Trade Facilitation and Trade Enforcement Act of 2015, it is the US Treasury that determines the individual thresholds. A wider definition of identifying currency manipulation has been produced Bergsten and Gagnon (2017) at the Peterson Institute for International Economics. Their updated analysis shows Switzerland, Taiwan, Israel and Thailand all meet the US's broader FX manipulation criteria.